As an infill neighborhood, Echo Spur sets a new standard for green and energy efficient living in our highly coveted Old Town location. Echo Spur will seek to minimize outside energy sources. In addition to our eco-friendly building strategy, Echo Spur’s convenient location offers another way for our homeowners to live green because we are within walking distance to Park City’s free transit system, PCMR’s Old Town Lift, Main Street’s abundant shops and restaurants, and hundreds of miles of hiking and biking trails. Park City’s beauty, recreational and cultural offerings coupled with superb accessibility have attracted a primary and second-home population from all over the world seeking a fulfilling lifestyle complete with ample business opportunities. It’s also no wonder luxury properties like St. Regis Deer Valley, Waldorf Astoria and Montage Deer Valley have opened in recent years. 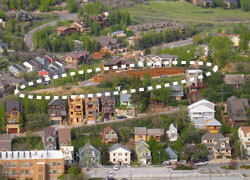 None, however, can match Echo Spur’s ability to place the owner in the center of the real Park City.